One thing that drives me mad in my social media feeds are the images that accompany articles on leadership. 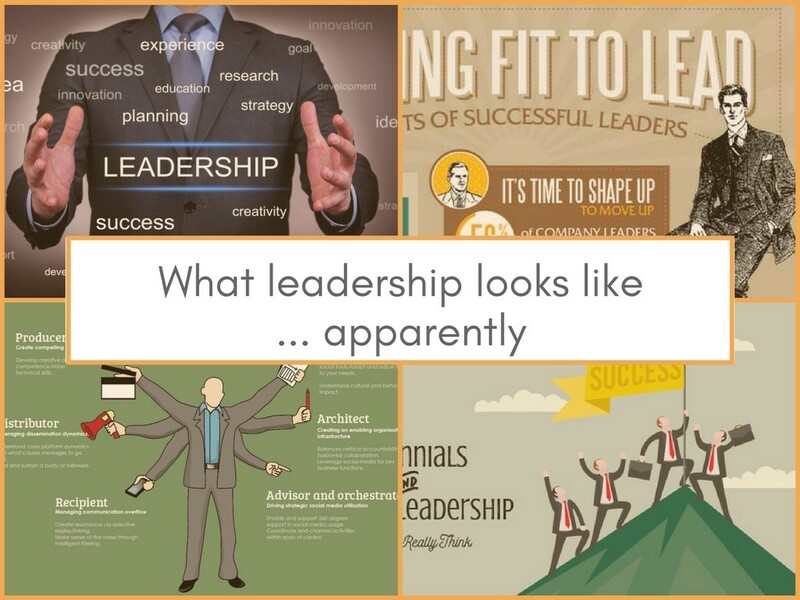 Infographics about leaders often feature male suited figures. An Google image search for ‘leader’ results in swarms of male figures in front of a group or standing atop a mountain. This presents a very limited notion of what a leader is or to what leaders should aspire. The men photographed or illustrated for these images of leadership tend to be white and photogenic, and wearing suits or capes. Leader as man. Leader as hero. Leader as at the apex. Leader as forging ahead. Some of the academic writing I’ve been doing around leadership, in the form of journal articles and book chapters, has me revisiting my thinking around leadership. I’ve written before about challenging traditional notions of what a leader is and what they do. I wonder how my own approach and journey might play a part in offering alternative narratives of leadership. How does my story allow others to imagine a leader who may not be out in front, or on top, or male, or in a suit, or wearing a cape? How might leaders or aspirant leaders give themselves permission to lead differently, or to aspire to images of leadership that are different: softer, more collaborative, less visible, more joyful? This isn’t about being a woman or a man, but about everyone being able to access a continuum of ways of being and leading. Or perhaps it isn’t a continuum but a web of possibilities, connected but divergent. I have always lived the educational cliché – doing my very best, striving for high achievement, immersing myself in lifelong learning. Many of the leaders in my PhD study said the same: not only had they drunk the Kool-Aid of education, but they also felt its essence down to their bones. Leading, teaching, and learning aren’t add-ons or aspirations, but ways of being based on deeply held beliefs. I have been a school leader since my first principal took a chance on me by promoting me to a Head of Faculty position in my second year of teaching. I was 22 years of age. I was tasked with leading teachers who had been teaching for more years than I had been living. My approach then, similarly to my approach now, was around building trust and relationships as the foundation stones of leadership. As Bryk and Schneider (2002) assert, relational trust is the connective tissue that binds together individuals with the common mission of advancing the education and welfare of students. Now, my leadership style is based in an understanding of leadership literature, valuing of relationships, belief in the capacities of those I lead, and willingness to listen equally to enthusiastic perspectives and dissenting voices. My PhD and current role mean that I am a practitioner committed to I research-informed and data-rich practice. I also, however, place great value in practitioner experience, the wisdom of professional practice, and the capacity of those with whom I work, to grow, improve, and serve their students and communities. My approach to school and cultural change is ‘go slow to go fast’. Deliberate, collaborative change coaxes buy-in and ownership from stakeholders. It involves creating a shared need, designing a shared vision, and then energising, mobilising, and building the capacities and motivations of others to propel change. This kind of leadership isn’t about me, but about how to fire holonomy (Costa & Garmston, 2015): the nuanced interactions between ‘me’ and ‘we’, individual and organisation, cog and machine. As Andy Hargreaves and Michael Fullan (2012) point out, the group is more powerful than the individual in school and system change. The reason that I continue to blog, to edit and contribute to books, to act as a peer reviewer for journal articles, to engage at conferences and online, is because I want to be part of shaping narratives of education and leadership. It is my hope that through sharing my voice I can be part of offering alternatives and providing solutions. I have had two children along the way, and have navigated my way through the decision-making that comes with finding ways to be a good parent, a good spouse, and to do work that I think makes a difference in the world. As a leader I am mindful of the example I set for others in the decisions I make around work, family, and wellbeing. As a leader, I don’t aspire to embody the hero, perform the all-knowing problem-fixer, or forge ahead with innovation at a rate of knots. I aim to be my authentic self and work to empower and elevate others in what Andy Hargreaves, Alan Boyle, and Alma Harris (2014) call ‘uplifting leadership’. Sometimes leading means holding the line or being calm in the eye of a storm. It often means giving others what they need based simultaneously on a balcony view of the macro picture, and an intimate understanding of the individual. Bryk, A., & Schneider, B. (2002). Trust in schools: A core resource for improvement. Russell Sage Foundation. Costa, A. L., & Garmston, R. J. (2015). Cognitive Coaching: Developing self-directed leaders and learners. Hawker Brownlow Education. Hargreaves, A., Boyle, A., & Harris, A. (2014). Uplifting leadership: How organisations, teams, and communities raise performance. John Wiley & Sons. Hargreaves, A., & Fullan, M. (2012). Professional capital: Transforming teaching in every school. Teachers College Press.